Lightweight, broad spectrum tinted moisturizer with SPF 45 that protects against harmful UVA rays, UVB rays, and infrared radiation. Perfect for that no-make up look. This formula easily absorbs into your skin, providing instant moisture and hydration without leaving a greasy residue. 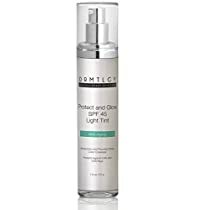 high level of Niacinamide (Vitamin B3), Vitamin E, Zinc, and Hyaluronic Acid to help protect skin from premature aging and gives youthfulness to the skin.